1Can the father and the child pose in the same picture? 2How long does it take for results? 3How will I get my results? 4Can I use the results in court or other legal purposes? 5After I receive the results of the facial scan, can I use the money paid towards the cost of an actual blood or mouth swab test? Typically, no. You'd want to look at our coupon page or call (800) 219-4362 to schedule an office visit and inquire about any current discount offers. 6What is Electronic DNA Facial Point Connectivity "EDFPC"™? EDFPC ™ is the latest technological system that offers a preliminary report on whether or not two people could share relationship. EDFPC ™ is a manual study of facial traits and a comparison of the hereditary characteristics of two individuals. 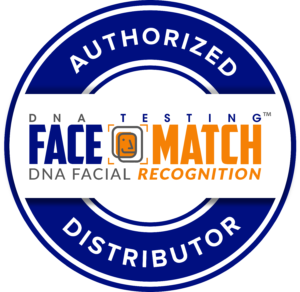 Face It DNA Technology DNA Facial Recognition LLC owns the algorithms, intellectual properties and processes of EDFPC ™ / FACE MATCH system. 1Is there a Groupon or any coupons available for EDFPC™? 2How accurate are your results? The advantage of completing an actually blood test or mouth swab is that experts can literally detect the genetic makeup of an individual using actual DNA loci and markers though a system called polymerase chain reaction "PCR". Electronic DNA Facial Point Connectivity can’t dive into a person’s internal DNA pattern through a computer, however what Electronic DNA Facial Point Connectivity “EDFPC” does do is calculate facial patterns and hereditary traits that can and in other cases can NOT be passed from an alleged parent. The laws of science are very straight forward. Some genetic traits are not transferable from a parent to a child if the person scanned is not the actual father. With a blood or mouth swab test results are up to 99% accurate. "EDFPC" has an accuracy level of being correct of roughly 92%. "EDFPC" results gives you a realistic suggestion on rather or not an actual blood test should be completed. Electronic DNA Facial Point Connectivity is the fastest way available to assist an answering DNA Paternity questions. It offers same day results from your facial scan and questionnaire. 3If I don't have all the answers to the questionnaire can I still request a Facial Recognition Report? 4What are the percentages of our Electronic DNA Facial Point Connectivity “EDFPC”™ reports? A number of different factors are taken into consideration when discovering findings and completing your results report. Your pictures are studied and your hereditary characteristics are studied. It’s important to answer as many questions as possible in your questionnaire to give a more accurate percentage. Each of the 16 points studied also contribute to the percentages. Yielding you a range of a 0% match up to as high as 100% match. 5What time of the day should I expect to receive my report? Reports are released the same day of your submission (as long as you submit prior to 4 PM Central Time) between the hours of 9 AM and 9 PM. You'll receive an email PDF explaining your report. 6Do I NEED to upload pictures or can I get answers by completing only the questionnaire? Both the alleged father and child's photo MUST be uploaded. This is a key factor in the entire FACE IT™ FACE Match ™ process. The questionnaire alone is not enough to complete a full report.